I have already gotten tired of candy and Valentine's Day is still days away. I'm not anti-Valentine's Day, but I do hate all the sweets that go along with the holiday. Many people think that I am mean, but I do not allow candy and pre-packaged sweets in my house. And when I say none I mean none. I bake cookies, cakes and treats from scratch, but I try to limit the amount of granulated sugar that my family consumes so I bake with honey and molasses. Inevitably during holidays my kids receive candy and treats from relatives. Since they don't normally eat foods with large amounts of corn syrup and sugar they tend to get very cranky and melt down after only a few pieces. Today the candy that they have went into a bag for my husband to take to work. This happened after my oldest cried for an hour wanting another piece of candy after he had eaten way too many mini Butterfingers bars. He's lucky that I didn't throw them in the trash, which I have also been known to do. To make up for all the candy eating that happened in my house the last couple of days, I decided for dinner tonight to make a protein that my kids would like. 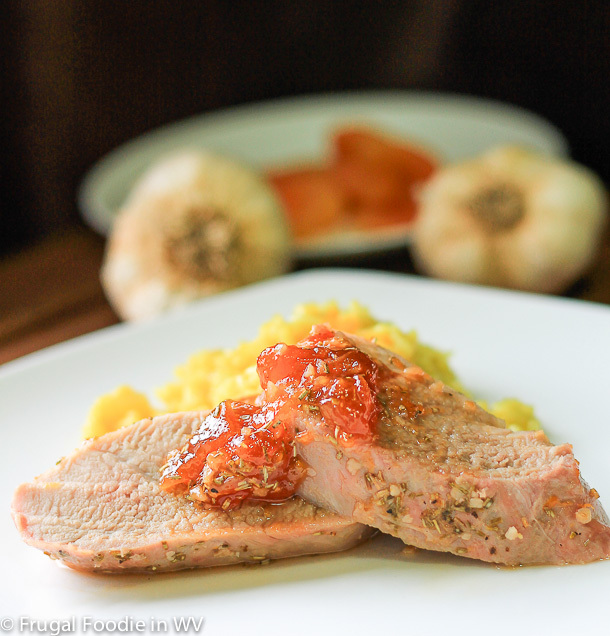 Pork is always a popular favorite and everyone in my house absolutely loves pork tenderloin. Tonight I tried a new recipe for Rosemary-Apricot Pork Tenderloin from the December/January 2012 issue of Taste of Home magazine. This recipe has 8 ingredients. It takes 40 minutes of total time, 15 minutes of which is active and makes 8 servings. For the rosemary I used crushed dried rosemary. Fresh rosemary is just too expensive at the store and my herb garden was non-existent last summer thanks to squirrels and cats. For the apricot preserves I used all natural preserves. I am not a fan of the cheaper jams that use corn syrup as a main ingredient. They taste too sugary and have more apple juice than actual fruit. Last summer I canned a bunch of jam that I had planned on using this winter, but thanks to my two boys it was eaten within a couple of months. For a side dish I modified the Curried Apricot Couscous recipe from the same page of the magazine. Since I eat gluten free I substituted rice for the couscous, added 3 cups of homemade chicken stock and modified the cooking time to 20 minutes. The recipe cooks the pork to 160 and pulls it out of the oven to rest. That is way too high of a temp. The FDA now states that the temp for pork is 145 with a 5 minute rest. During the rest the temp will go up approximately 5 degrees to 150. If you were to cook the pork to 160 degrees, it would be over done. If you don't already own a well made meat thermometer, buy one. They are a very important kitchen tool that can mean the difference between delicious and over cooked meat. I temp all meat that I cook to ensure that it gets just done without before over done and tough. The pork in this dish turned out very tender. My two boys stated they weren't hungry for dinner, but after tasting the pork they ate an entire serving. The glaze has a nice sweetness, without being over sweet and is balanced nicely by the rosemary. I think for this recipe I prefer using the dried rosemary like I did, so it wasn't overpowering and worked well with the glaze. For the recipe go to Rosemary-Apricot Pork Tenderloin. Hi. This looks yummy. Visiting from Blog Hop til you drop. Now following. Have a great week. Thanks :) Visited your blog, thanks for dropping by! I love apricot glazes, but I am the only one in the house that likes the flavor. Hey new follower stopping by from the mom mingle! What a unique blog, I have some catching up to do!! Hello. I'm a new follower. Your blog makes me hungry. I love to cook and I will be trying your pork tedish, it looks amazing. Thanks :) If you try it tell me how it turns out! Rosemary and Apricot sound like a wonderful combo! They really do work well together! wow, that looks great! I love the combo of rosemary and fruit! Thanks :) I loved the rosemary and fruit, it was a great combo!